[/vc_column_text][/vc_column][/vc_row][vc_row][vc_column][vc_column_text]On the 27th of September 2016 Gabriel Hibert from Toulouse – France came over to record a White Noise Session.His performance is best described as cinematic improvisation. 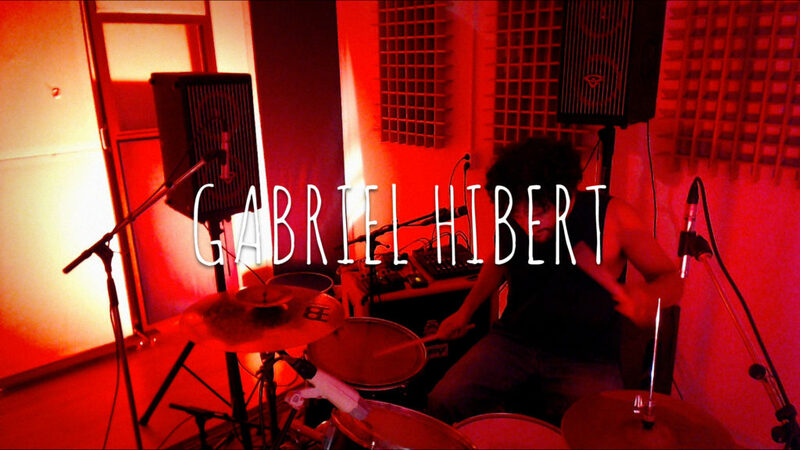 A blog on how Gabriel’s session was recorded and mixed. Gabriel has an unique way of performing. To get his cinematic sound he heavily relies on effect pedals. These included pedals such as loopers and pitch shifters. To get sound into these pedals, a microphone captures all kinds of sounds. These sounds include his voice or various parts of his 4 piece drumkit. A sampler or a backingtrack is used for the longer atmospheric sounds. To round it off, Gabriel brings his own PA with 2 tops and a sub which are placed behind the drums. As said before Gabriel has a unique way of performing. To capture all of this, I checked how the sound of his drums and PA projected in the room. The first thing I did was to place 2 roommics in a XY configuration at about 1,5 meters before his drums. This captured a nice blend of acoustic drums and PA sound. The drums themselves were mic’d pretty standard with a close mic in top of the snare and close mics on the toms and bassdrum. The floortom mic was placed underneath the floortom pointing upwards. This was done to reject as mich of the PA as possible and to get more of an “oomph” sound from the floor. There was no need for lots of attack in the floor. The overheads were used more or less as close mics on the cymbal and hihat. The bulk of the sound was coming from the roommics anyway. These close overheads provided definition where needed. The output of samples and loops were fed trough the PA, which was recorded as DI from Gabriel’s mixer. The mix was all about vibe. It always is actually. The key to get the cinematic part in the mix was reverb. And quite a lot. A while back, me and Freek Philippi sampled the old 1930’s reverb chambers of the former dutch Avro broadcast building in Hilversum. These samples were put to good use in this session. The output of Gabriel’s pedals was mono. This was the first application for the sampled reverbs. Two long, mono reverb samples were selected. One was put on the left channel and the other on the right. This gave a wide stereospread. The reverb samples had a resonating frequency in them, inherent of the reverb samples. This actually blended wonderfully with the output of the mixer. Normally, I would have dipped the resonating frequency either before or after the reverb.